Mopping up spills has never been easier with our Tissue Mansize packs. Designed for busy environments, these super soft 2ply tissues have a high level of absorbancy paired with a mansize dimension. This allows you to tackle spills and soils in the most resourceful of ways and minimizes waste within your business. The pebble box design uses neutral colours to blend in well with any environment alongside keeping each tissue in pristine condition until required. An open slit along the top allows a single tissue to be removed at any given time. 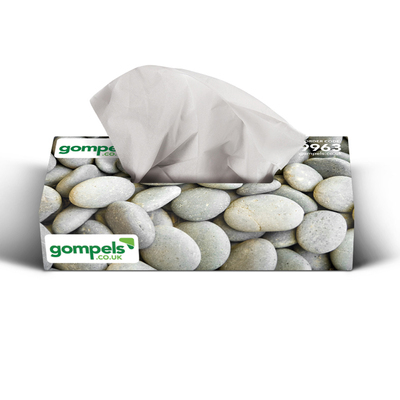 These larger tissue mansize packs are perfect for the office, nurseries and care homes alike. We have a wide selection of tissues to serve all different situations. From our portable Proform Pocket Tissue Packs through to our vibrant Proform Union Jack Facial Tissues, all of our products are chosen for their quality and wholesale prices.